The Technical Education and Skills Development Authority will implement skills training programs to the barangays even to the isolated communities in the region.TESDA is now implementing this flagship program entitled, “Barangay Kasanayan Para Sa Kabuhayan at Kapayapaan” which is to identify the training needs of every barangay. This is under Technical Vocational Education and Training or TVET for Social Equity based on the universal principle of social inclusion, sites and people, particularly those who are socially excluded and displaced such as informal workers, fisherfolks, indigenous people, farmers, drug dependents or surrenderees, women victims of abuse and human trafficking, especially OFW’s and Persons with disabilities (PWDs). The approach used in this program is community-driven. This is to ensure the training delivery and continuous consultations and collaboration at the grassroots levels, not only within the community, but also with the other government agencies. This program will be area-specific, flexible, holistic, resource-based, product and service oriented. This will serve as a driving force for change and upliftment of the lives of the Filipino people, contributing to the socio-economic development of our country. The online application process would take 5-10 minutes. 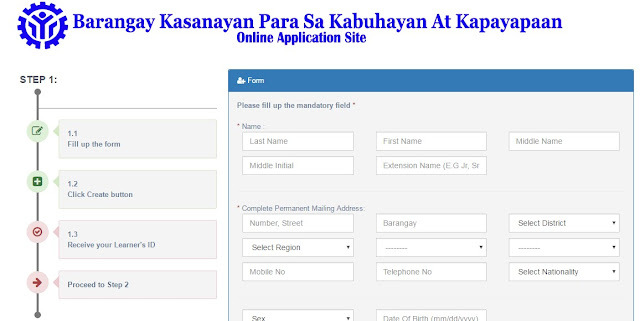 Go to this TESDA page and fill up the online application form with your name, permanent address, birthday and active email address. Don't forget to Agree the term and condition of the form in order to proceed to the next step. Then click the Create button. Go to this "page" and select a course you want to take. Check your email for the feedback of TESDA office. yung ibang venue na school ang pinagbibigyan nila ng scholarship puro estudtyante rin nila kahit di qualified, sige ewan lang kung tototong may nangyayaring discussion doon.. minsan kasi malalaman mo sa performance ng estudyante kung paano hinahandle ng school yung pagtuturo nila.. feeling na nakaanim na take na ng tesda scholar yung isang estudyante dahil sa tuwing my offer ung venue na school required mga student nila ang mgtake din! !